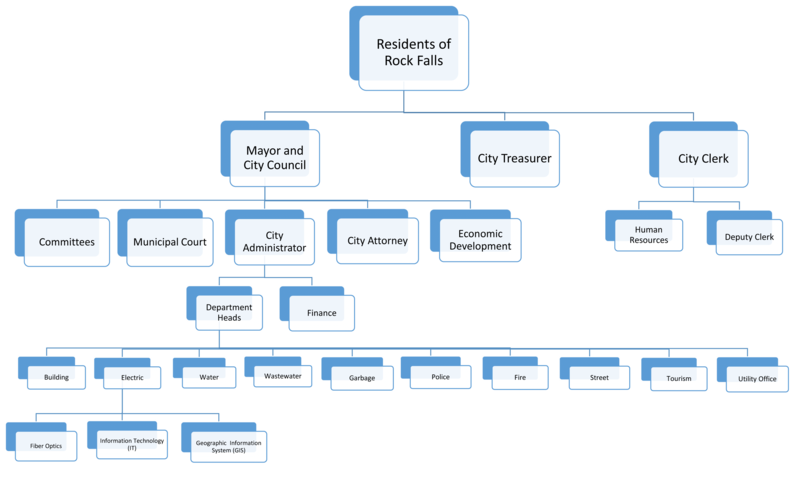 The City of Rock Falls has an annual budget of $22 million dollars. The City’s fiscal year begins on May 1st and ends on April 30th of each year. The form of government is Council-Strong Mayor and has 8 elected Aldermen representing four Wards within the City’s corporate limits who all serve 4-year terms. The City Clerk and City Treasurer are both elected officials and also serve 4-year terms. The City employs a City Administrator who is responsible for the annual budget, finances and department head supervision of all departments within the City. The City Administrator is a contractual employee of the City who is appointed by the Mayor and approved by the City Council. The Mayor appoints members to committees consisting of the elected Aldermen and private citizens within the community to oversee and direct different aspects of the City’s responsibilities. The City employs 90 people including both full and part-time employees. The City has five (5) collective bargaining units who represent approximately 85% of the employees.